A Gallery of pictures has been added to the 'Archives' Section of the site of the Hogarth's Marionette Circus. The Circus was one of Jan Bussell and Ann Hogarth's earliest and most-performed productions. A new section of the Website has been added, grouping together articles and galleries from the Douglas Hayward Puppetry Archives. These pages highlight examples of the work of some of Britain's Pioneers of the Art of Puppetry. 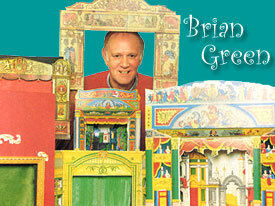 An article on the 40-year puppet career of Brian Green has been added. 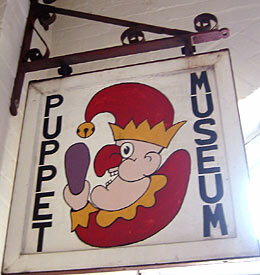 An item has been added to the Articles Page on the Douglas Hayward Puppet Collection; a permanent exhibition of around 200 puppets, housed in the County Museum, Shugborough Estate, Milford, near Stafford. 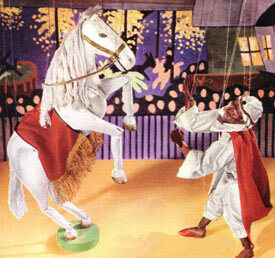 An Article on The D'Albert Marionettes has been added to the Articles Page. 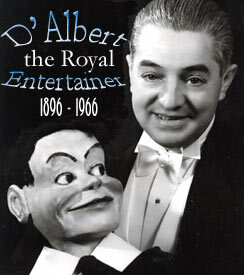 D'Albert was a highly versatile entertainer who performed with various types of puppets (but notably with marionettes strung on the traditional Old English two-stick controls) in the North of England from the early 1920s to the late 1950s. 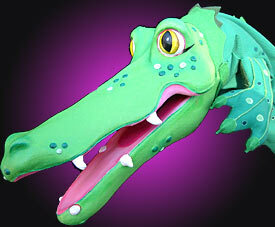 With the addition of the Crocodile (above), all 9 characters of the Punch & Judy set are now complete. This head is in latex with plywood inserts in the mouth. The mouth movements is achieved with a strong metal hinge. 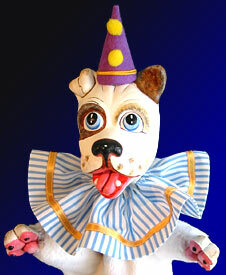 This is the completed version of Toby the Dog, the 8th puppet to join the Punch & Judy collection of characters. Head and paws in latex. 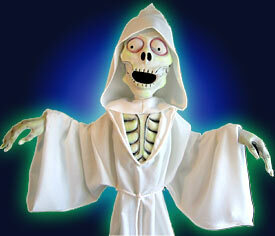 The ghost has now joined the set of completed Punch & Judy Characters. This is a rod puppet with head, hands and torso in latex.